The green laser is a tunable weak link in the circuit that can switch off the atom current. In atomtronics scientists construct circuit elements using ultra-cold atomic gases where the atoms take the role of electrons. PFC scientists have developed an experiment that not only generates persistent superfluid currents--frictionless flow; this quantum fluid can be configured to switch atom-currents on and off. This work spans condensed matter, atomic physics, and specialized optics. The first step is to create long-lived superflow in a ring-shaped Bose-Einstein condensate. They use special laser beams to add rotational momentum to the atom cloud, thus creating superflow. Generating persistent current-- in this case lasting 40 seconds-- was not easy, as defects in the atom trap can cause the current to disappear. The researchers designed their atom trap to be completely made of laser light, producing an extremely smooth all-optical donut-shaped potential in which to study both the superflow and atomtronics. 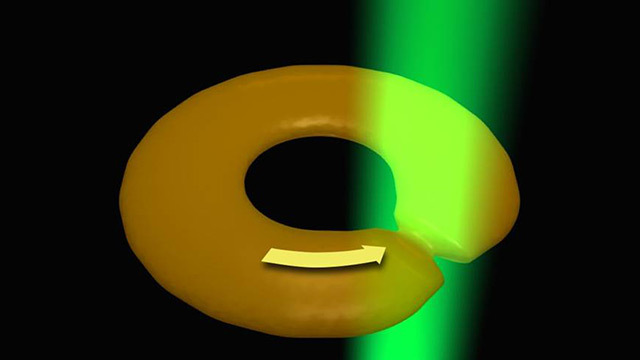 A “weak link” was created by focusing a green laser beam into the path of the superflow. The scientists control the amplitude of the obstruction by adjusting the laser power. The barrier is analogous to a constriction in a pipe, causing the flow in the narrow region to speed-up and become turbulent. The conditions for current flow cannot be maintained when the local velocity near the barrier becomes sufficiently fast. At this critical value, the weak link abruptly shuts-off the superflow, like a switch.